Valentino‘s Spring 2019 haute couture show just ended with a pleasant surprise: a closing walk by Naomi Campbell. The runway legend made an unexpected appearance on the catwalk in Paris, emerging in a Pierpaolo Piccioli-designed sheer black gown with voluminous sleeves and a tiered ruffle skirt. 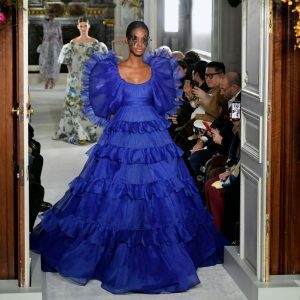 Along with this appearance of a treasured supermodel, Valentino delivered dramatic silhouettes, bold colors, and whimsical florals with its couture show today. As looks like Naomi’s showed, frills and ruffles were definitely not off-limits. Campbell has been making her rounds at the Paris shows in the past few days as a viewer for Men’s Fashion Week. She was recently spotted at an Azzedine Alaïa tribute event, as well as in the front rows for Dior and Louis Vuitton’s menswear shows. Campbell’s runway appearances have been selective as of late. One of her latest catwalk cameos was in New York last October, for the launch of the Moschino x H&M collection. Months earlier, she also walked for Miu Miu’s Cruise 2019 showand Dolce & Gabbana’s Alta Moda show in July. With Fall 2019 fashion month right around the corner, we’ve got our fingers crossed for another one of Naomi’s surprise runway moments.